“Your brethren who live in the east are in urgent need of your help . . . the Turks and Arabs have attacked them. . . I, or rather the Lord, beseech you . . . to carry aid promptly to those Christians and to destroy that vile race from the lands of our friends . . . Moreover, Christ commands it . . . All who die in battle against the pagans, shall have immediate remission of sins. This I grant them through the power of God.” — Pope Urban II’s “speech against the infidels,” at the Council of Clermont, France, November 27, 1095, according to the version of Fulcher of Chartres. With those words spoken 919 years ago next month, Pope Urban II lit the fuse in a series of wars that would see the often violent deaths of hundreds of thousands, if not millions, of men, women, and children of the Muslim and Jewish faiths. While the First Crusade began as a campaign to take back the Holy Land from Muslim invaders, it would give way to six more major Christian crusades over the next two centuries. If it had been possible to conduct a global survey of non-Catholics between the years 1096 and 1291, the overwhelming majority of the earth’s population undoubtedly would have defined Christianity as a violent religion, whose holy book inspired zealots to brutally slaughter non-believers on the promise of eternal salvation. It also doesn’t take much to imagine how abhorrent Christianity would have appeared if the worst atrocities of the most zealous crusaders were played day after day on the World Wide Web. YANGON–One of them has helped reforest environmentally threatened regions and donated money to assist children with Down syndrome. A portion of every ticket his airline sells goes to social welfare organizations. And when Cyclone Nargis devastated Myanmar in 2008, his foundation contributed more than $8 million to rebuild schools, hospitals, and monasteries. The other has footed the bill for school fees and medical expenses for the families of Myanmar’s political prisoners. He is actively recruiting doctors from other nations to improve the health care system here, and oversees the only national institution — the Myanmar football league — in which ethnic minorities participate on an equal footing with ethnic Burmans. And at a time when corruption threatens to derail this country’s nascent democracy, he is the highest-profile business leader to have opened his books to an internationally-respected accounting firm and then personally presented the full audit to United States Ambassador Derek Mitchell. Which is not to say that Tay Za and Zaw Zaw, two of the most successful businessmen in Myanmar (formerly known as Burma), are Boy Scouts. Over the past two decades, the head of the Htoo Group and the 46-year-old chairman of the Max Myanmar Group built their vast conglomerates of companies — stretching from banking to hotels to construction — by thriving on connections they developed with a regime notorious for human rights abuses. 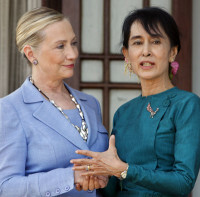 Those contacts landed the two on the U.S. government’s Myanmar sanctions list, which bans American individuals and companies from doing business with any friends of the old regime. LONDON-Once a closed society, Myanmar, previously known as Burma, has emerged since 2010 as one of the world’s democratic hopes. But amidst the euphoria surrounding a seemingly miraculous transformation, American policy makers have missed one essential fact: Myanmar functions as at least five countries struggling to escape overlordship of a sixth. National reconciliation is Myanmar’s greatest need and should be, with an eye toward China, America’s Myanmar policy’s highest priority. Ethnic Baman or Burmans make up the majority of the country’s 60 million people. Buddhists of the central lowlands, Burmans dominate the government, economy and army. Other significant ethnic groups include the Kachin (who are Christians) bordering China; the Shan (Buddhists) bordering China, Laos and Thailand; the Karen (Christians and Buddhists) bordering Thailand; the Chin (Christians and Buddhists) bordering India; and Muslims bordering the Bay of Bengal and Bangladesh. The struggle of non-Burmans for an equal place in the country and the opposition of ethnic Burmans is the story of modern Myanmar. Here is the chronology. Playing in theaters across the United States is a film called ” Upside Down, ” about an alternate universe where twin worlds sit stacked like bread in a sandwich, separated by opposite gravities. If our world could somehow have a similar twin, last month would have marked the tenth anniversary of Saddam Hussein’s willingness to abandon his nuclear program without a shot being fired. Headline writers would have sung the praises of the sanctions regime imposed by the United Nations, which compelled Saddam to abandon his push for weapons of mass destruction. Abu Ghraib would still be a little-known, nondescript prison on the outskirts of Baghdad. And 4,808 American soldiers would still be alive to celebrate birthdays, weddings and Little League baseball games. MANDALAY–Reading the news that the Chinese army systematically hacked into United States computer networks brought to mind another group of soldiers who engaged in an entirely different kind of hacking here seven decades ago: Merrill’s Marauders. What makes them most memorable is that it was one of the few times that American and Chinese soldiers fought on the same side against a common enemy.